Whale, whale, whale, what have we here? Yes the Big 5, Table Mountain, and a spectacular flower season, but this month we celebrate the whale season in South Africa and the gentle giants of the sea as they grace our coastlines with their presence. 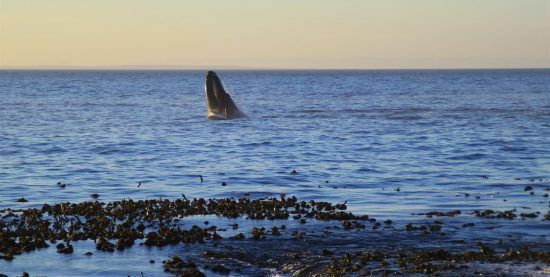 Brush up on your lingo, and watch several different types of whales showing off their breaching, fluking, lobtailing, logging, spouting and spyhopping from the comforts of the South African shore. It really is an over-whale-ming experience. 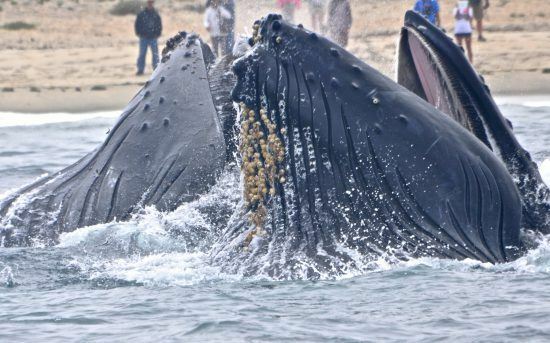 Migrating from their feeding grounds in Antarctica to the safe, warmer and nurturing shores of Cape Town, it’s a whale baby boom around this time. When can you see the whales? Marvel at the Southern Right, Humpback and Bryde whales and their unrivaled power during their water aerobics between June and November of each year. 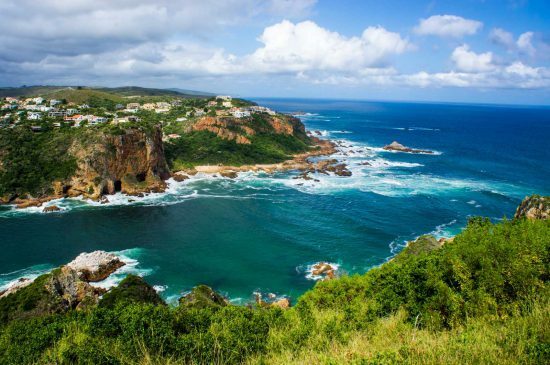 This six month window gives you enough time to explore the South African coast line and its quaint towns, while catching incredible views of the whales. This season also overlaps with the wildflower season in the Western Cape, the perfect opportunity to hit two birds with one stone. You’ll whale if you miss these phenomenona! 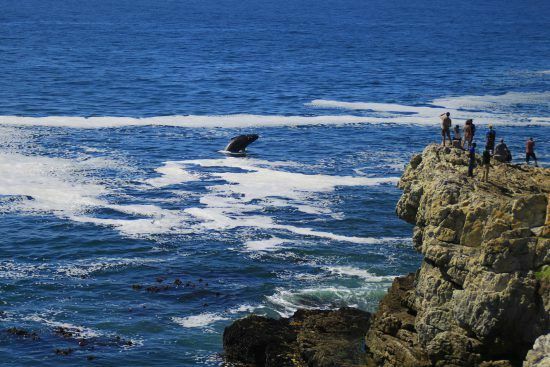 Hermanus, the whale capital, was ranked in the top 12 whale watching locations in the world by the World Wildlife Fund. Only a two hour drive from Cape Town, this little town is the heart of the Whale Route. Watch as whales come within metres of the shores, and join in on the festivities of the annual Hermanus Whale Festival (this year held on the 29th of September until the 1st of October 2017). Great viewings can be had from terraces such as Old Harbour and Gearing Point and other great spots include Gansbaai, Grootbos Nature Reserve, Dreunkrans, Siever’s Point, VoelKlip and Grotto beaches. 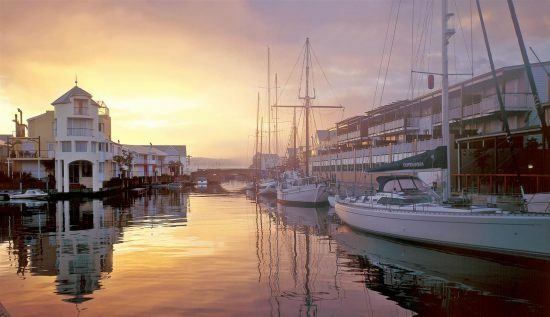 In and around the Cape Town area lies the picturesque False Bay. With many roads hugging the coastline and on higher points, you’re bound to catch great sightings of the giants of the sea. 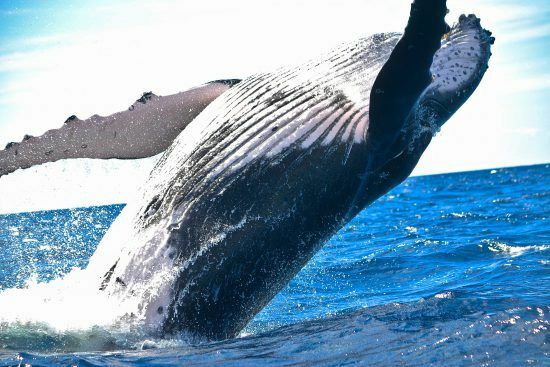 Roads such as Boyes Drive, Clarence Drive, Chapman’s Peak, Jager’s Walk, Baden Powell Drive and Cape Point are some of the best routes on which to see the whales. 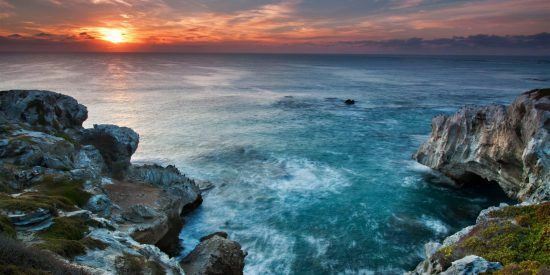 Self-drive through the many meandering roads in the Cape Town region with this guide: Dreamy Drives- Roadtrips Around Cape Town. You can even catch great views of the whales just sitting at coastline restaurants, such as The Brass Bell in Kalk Bay. Embark on a five-day Whale Trail walk, which transverses the De Hoop Nature Reserve and Marine Reserve, one of the Western Cape’s most beautiful and unspoiled coastlines with whale nurseries spread across its’ shores (Note: the Whale Trail needs to be booked at least a year in advance). 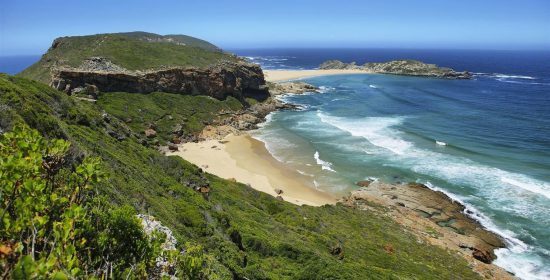 Only three hours out of Cape Town, explore the beautiful, diverse and fynbos-filled nature reserve, breathing in the salty sea air and staying at comfortable accommodation along the route. 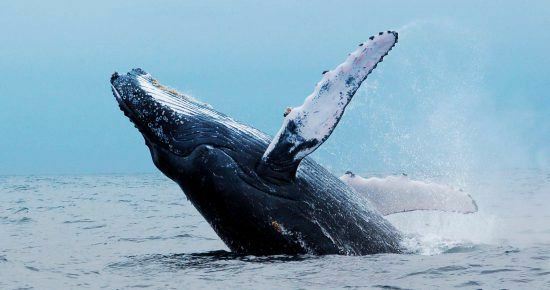 Over 50 whales have been spotted together mere kilometres from the coast. 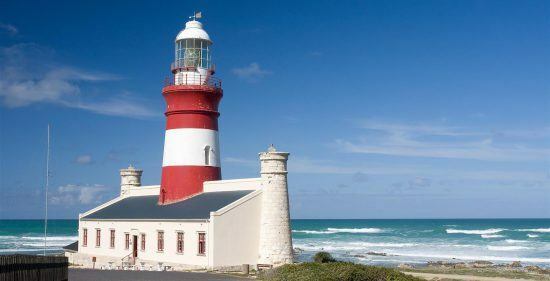 Close by lies the idyllic coastal village of Arniston, another great whale watching spot and a must-see if in the area. What types of whales can you see? 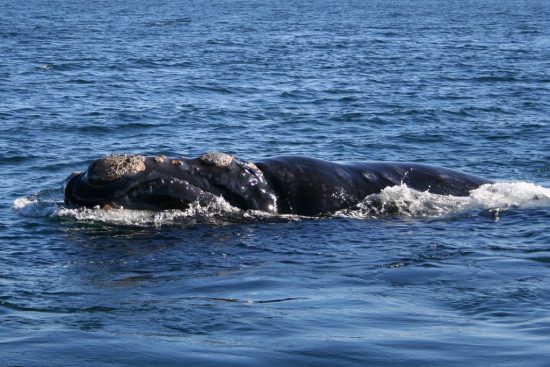 The southern right whale’s most distinctive feature are the callosities on its’ head. The callosities patterns formed on their heads are individually distinctive, so look out for southern right whales you may have previously spotted. Another important feature to note are their fan-shaped flippers which they may decide to wave at you. These giants are 15m in length, can reach weights of at least 100 tons and are mainly black in colour. White patches can be seen on their bellies and on the odd occasion on their backs. They have large heads, a bowed mouth-line, a snout which is very narrow and broad flukes. Hopefully the southern right whale is friendly this season and puts on a performance for you. 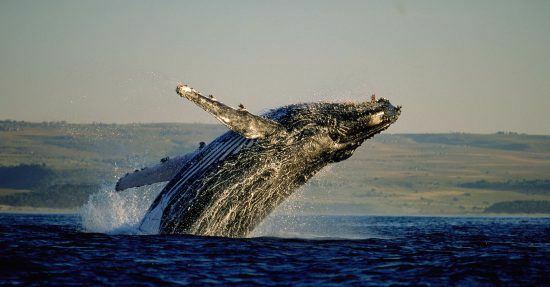 The most confident and common to visit our coastline are the humpback whales, migrating towards Mozambique and Madagascar to breed and calve. They can be identified by their robust bodies, humps and their long and bumpy pectoral fins (up to one third of its’ bodies length). Their flukes are concave and have a serrated edge, and their small dorsal fin sits on their hump on their lower back. The anterior of their mouths are covered in bumps, each containing a single sensory hair follicle. This black or dark grey bodied creature also has white underneaths (underneaths of belly, pectoral fins and fluke) and can reach lengths of 16m and weights of 35 tons. These are the shy giants, making their way up our shores and are often more difficult to find due to longer diving times (up to 20 minutes to depths of 300m). A distinguishing characteristic is their 40 to 70 throat pleats, as well as the three ridges near their blow hole. Their dorsal fin rises abruptly out of the back and is tall. They often exhale under water and so a little blow or no blow at all makes them harder to spot. They are present all year round, reach up to 15m long and can weigh up to 25 tons. South Africa is not only home to the Big 5, but also The Marine Big 5. While you’re watching the water aerobics performance of the whales look out for pods of many dolphins, Cape fur seals, great white sharks and the cute African penguins. 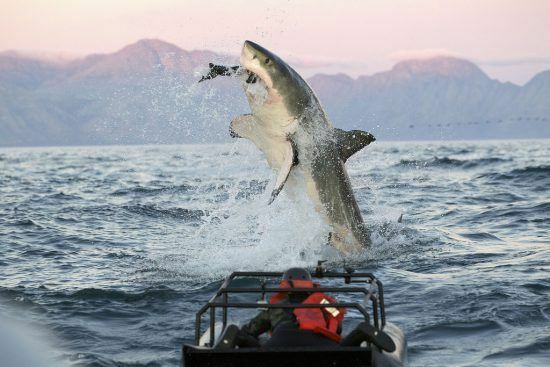 Breaching: leaping out the water and falling back with a splash. Blowing/spouting: the exhaling of air through their blowhole at the water surface. Fluking: Lifting the tail/fluke out of the water before diving beneath the water. Lobtailing: flapping the tail/fluke on the water creating a loud sound which can be heard from some distance. Logging: resting on the surface, swimming slowly. Often done very close together, revealing dorsal fin. Spyhopping: lifting of the upper body, bringing at least one eye out of the water, allowing the whale to see above the surface (for example when they’re near a boat). There are many opportunities to view the whales from boat, giving you a different perspective and potentially catching closer sightings of the marine life in South Africa. Please ensure you check with the boat company that they have a license for approaching whales. 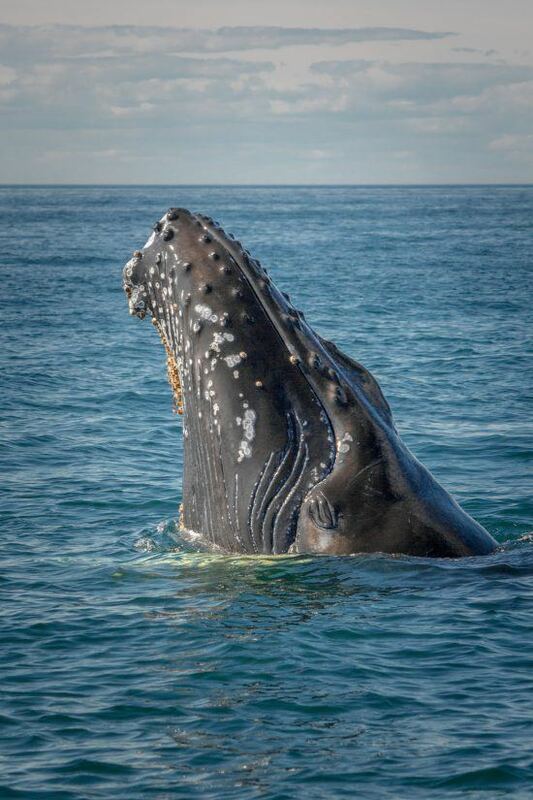 Whales normally breach from three to eight times in succession and it is believed that this could be a form of communication or relieving the itch of the parasites living on them. 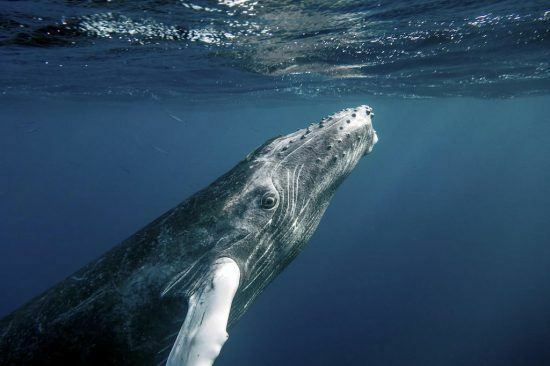 Humpback whales can live up to 50 years. 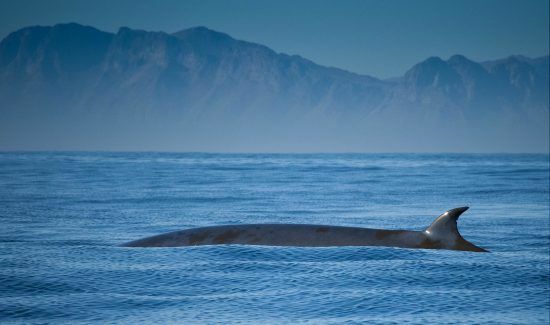 The Bryde’s whale was named after a Norwegian consul to South Africa, Johan Bryde, who built the first whaling stations in South Africa. The correct pronunciation of Bryde’s is ‘brewdus’. Lobtailing is thought to try and scare predators away with the loud sound created. Spouting looks different depending on the whale/dolphin, generally the larger the animal the higher the spout (the spout of a blue whale can reach up to 12m high). Skyhopping has also been said to help whales recognize different landmarks when migrating. 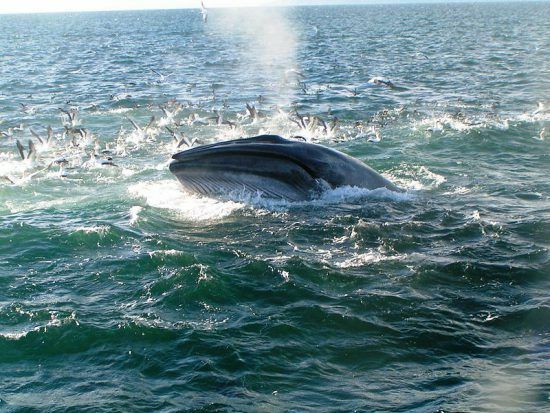 Bryde’s whales produce an offspring every two years and have a gestation period of 12 months. A fully grown southern right whale can weigh as much as eight adult African elephant. 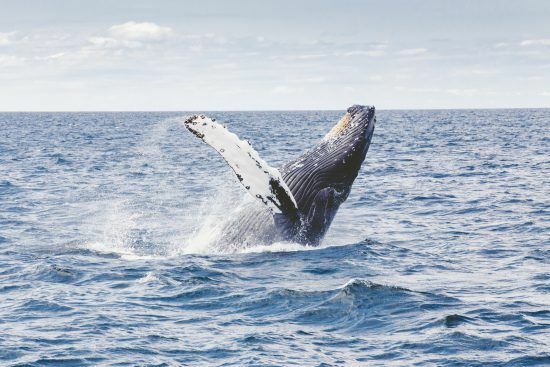 Make sure you don’t miss any whale watching bucket-list experiences with South Africa’s 7-step Whale Route Bucket List.